Pages also in english language now. ABRY WELCOMES YOU TO HIS WEB PAGES ABOUT JUGGLING! 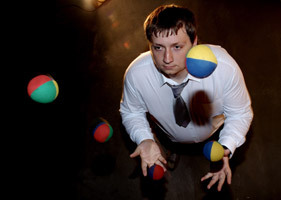 "Zongluj" is the czech word which means "juggle!" in English. This pages will mainly show You how to juggle 3 ball patterns. Juggling improves body coordination, peripheral vision, coordination of brain hemispheres and at last but not least it gives great relaxation. Juggling is also very addictive. Everyone can juggle - even You! If You want to start with juggling or if You want to know more about juggling, You're in the right place. I hope You will find these pages helpful. You can now continue to the section Patterns. And please be patient with my English - English is not my mother tongue.